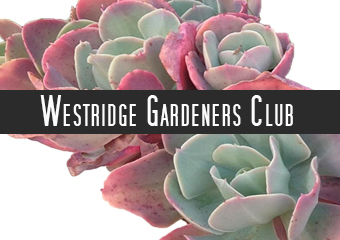 Members of the Westridge Gardeners celebrated the Club’s 60th anniversary at their February, 2009, meeting. President’s Message: There are few things lovelier than a garden in bloom. Gardening brings flowers and food to the table to sustain the soul. The simple acts of gardening – digging, working the dirt, and watering – have echoes that reach back to our childhood. As we garden, we connect with times past and present. Touching the earth also connects us literally and spiritually to all those who have dug, planted, and harvested before us. Gardening also offers us the opportunity to become friends with other gardeners. For me, the most important part of these connections is the friends I’ve made in this garden club. Now as we begin a new year, let’s continue to build upon these friendships as we develop our own gardening traditions.